The first is a rework of John Campbell's brief, unhappy phone call to former EQC minister Gerry Brownlee for Checkpoint. It had a rhythm to it and just for a laugh I looped the "John" "Yes?" part of the video and tweeted it. It was a rough sort of joke, frankly. Fortunately, Wellington alt-pop combo Gold Medal Famous ran with that ball and turned the interview into something really rather good. And earlier this week, another Twitter conversation led to this brief, bracing punk-rock commentary on the physical condition of Middlemore Hospital, whose title – 'Trade-Offs Between Taxation Rates And Infrastructure Maintenance Within The Health Sector' – takes nearly as long to say as the track lasts. And Dion Lunadon, lately of the D4 again, has a new song from his regular band A Place to Bury Strangers. It's on their album Pinned, which is out today. The Spinoff's "new Dunedin Sound" story has stirred quite a degree of controversy, not least in Dunedin itself, where many people believe that the batch of surfy-studenty bands it features do not represent the real Dunedin. Some of it sounds okay to me, and I'm struck by how popular it is, as measured by Spotify streams and sold-out shows in Auckland, but it's not really my argument to have. At any rate, there's a sort of balancing argument in the rather good Bandcamp Daily roundup New Zealand Indie: Beyond Flying Nun and the “Dunedin Sound”, by New York writer Nick Fulton. My friends at Southbound Records announced yesterday that they've sourced more than 300 RecordStore Day releases, including the remastered vinyl release of Unitone Hi-Fi's Wickedness Increased (only 300 copies worldwide). 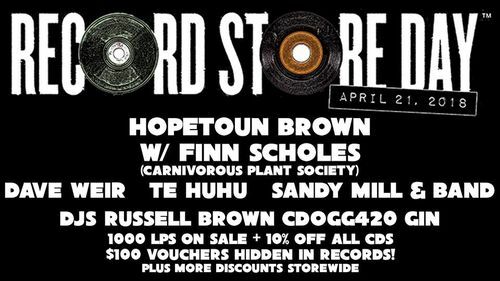 There'll also be a 95bFM live broadcast from 8am, 50% off second vinyl and free gifts. Meanwhile, I can't embed the Facebook video here, but this clip of Garfield Fleming singing along with his own 1981 disco classic 'Don't Send Me Away' at a vinyl flea market is really a very lovely thing. A bouncy tech-house remix of Joe Dukie and DJ Fitchie's evergreen 'Midnight Marauders' (free download). And a really nice Leftside Wobble rework of Sneaker Pimps' '6 Underground'. Not free, but only £1.50 on Bandcamp.